dB or more) I have been taking shorter and shorter exposures at higher and higher gain to reduce the effects of atmospheric seeing. Stan Moore has suggested this may be going too far, and that a little longer exposure but with less gain will have less noise and could give better detail. Obviously the longer the exposure the more blurring due to seeing, but on a night of very good seeing this effect may be small. Powermate, final FL about 9.7 meters (measured) using a PGR Flea3 camera, Astronomics Red filter and FireCapture capture and tracking software. Details of the exposure times and gain settings are on the images but were about 8.4 mSec and about 20 mSec respectively. 3000 frames were captured. 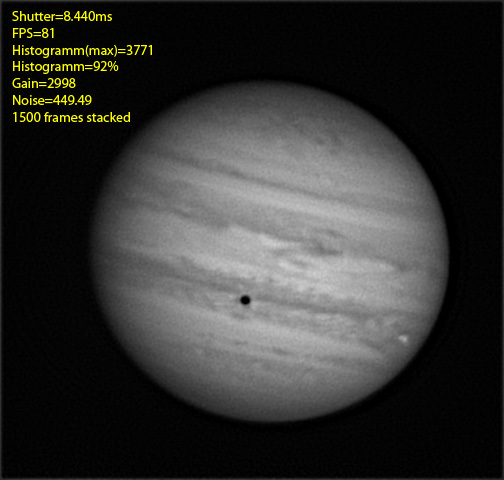 Either 450 or 1500 frames, as indicated, were stacked using Registax6. Once stacked the images were sharpened using the Registax Wavelet function. The sharpening was identical for all the images, but the denoise ("denoise"
noise in the short exposure image, and the processing needed to control that noise, outweigh the benefit of better seeing? "Noise" as stated below is from the FireCapture log. This means "1 SD of the difference between each pixel and its surrounding pixels". "Gain" is in "PGR units, ie dB x 100 so a gain of "2998" means "29.98 dB". The 8 mSec exposures used 6.78 dB more gain than the 20mSec images. You can right click on the images and download them to inspect them in more detail. 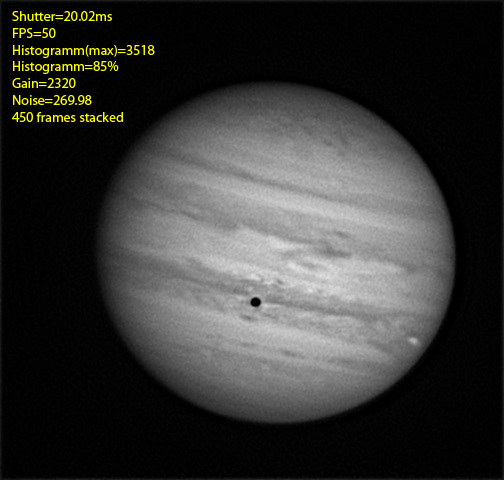 The images taken at 20 mSec exposure are sharper, because they allowed wavelet processing with less denoise. mSec requires less denoise and the final image has more detail. And on a night without very good seeing it's too blurry to webcam anyway.